Your favourite music and web browsing – anywhere. Every journey in your Porsche is a thrilling experience. It's even better when you have the right soundtrack. 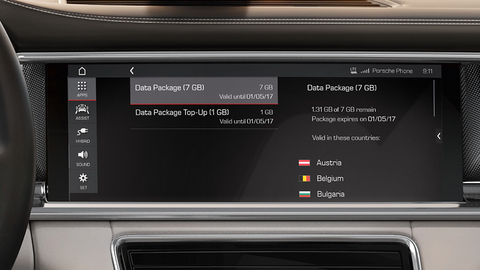 There is a 7-GB data package, so you can enjoy your favourite tunes and your passengers can surf the web via the integrated Wifi Hotspot. The package is valid for 30 days.